The 2010 Taco Bell All-Star Legends and Celebrity Softball Game at Angel Stadium of Anaheim. The All-Star Legends and Celebrity Softball Game is an annual game that brings former Major League Baseball all-stars and celebrities together in a friendly exhibition. The game is played the day before the Home Run Derby. It has been sponsored by RadioShack and Taco Bell; since 2015, it has no sponsor. The game started in 2001 in Seattle and is played at the site of that year's All-Star Game. It is broadcast on tape delay after the Home Run Derby on ESPN. The current broadcast team is Matt Danver and Eduardo Pérez. From 2001 to 2006, the game used standard softball rules with a temporary wall [220 feet (67 m) from home plate] on the field. In 2007, the rules were changed. Instead of 7 innings, there are only 5 innings with everyone on the team batting, whether or not they are in the field. From 2008–2012, it is unknown how long the game lasted. Since 2013, six innings are played. In place of extra innings, a swing-off was introduced. If the teams were tied at the end of 6 innings, each team would pick a batter in each round. Whoever hits the most home runs in the 5 rounds will win; otherwise, teams play sudden-death rounds until one team homers. The 2001 RadioShack Legends and Celebrity Softball Game was played on Sunday, July 8, 2001 at Safeco Field in Seattle, Washington. ESPN broadcast the game after the Home Run Derby. For this game the teams are named after specialty coffee drinks as a nod to the coffee industry in Seattle. The 2002 Radioshack Legends and Celebrity Softball Game was played on Sunday, July 7, 2002 at Miller Park in Milwaukee, Wisconsin. ESPN broadcast the game after the Home Run Derby with commentators Dave O'Brien and Rick Sutcliffe. Managers Kenny Mayne and Harold Reynolds also provided on field reporting. Pitcher Dave Winfield had a no-hitter going until the bottom of the third inning when Dale Earnhardt Jr. broke it up with a lead off single. Harold Reynolds' Brew Crew won the game 7-4. The 2003 Radioshack Legends and Celebrity Softball Game was played on Sunday, July 13, 2003 at U.S. Cellular Field in Chicago. ESPN broadcast the game after the Home Run Derby with commentators Dave O'Brien and Rick Sutcliffe. Managers Kenny Mayne and Harold Reynolds also provided on field reporting. In the bottom of the third inning, as The Bachelor star Andrew Firestone came to bat, manager Kenny Mayne brought in Firestone's then fiancé from the show, Jen Schefft, to pitch. Firestone popped out to the shortstop and the original pitcher was brought back in. In the next at bat Jimmy Kimmel singled but first baseman Bo Jackson successfully pulled the hidden ball trick on him to record an out. In the top of the fourth inning Jackson came to bat with a wooden bat that had pine tar on it that he claimed was given to him by George Brett. Manager Harold Reynolds challenged the amount of pine tar on the bat but the home plate umpire allowed it and Jackson then hit a home run. Kenny Mayne's Go-Go Sox won the game 7-4. The 2004 Taco Bell Legends and Celebrity Softball Game was played on Sunday, July 11, 2004 at Minute Maid Park in Houston, Texas. ESPN broadcast the game after the Home Run Derby with commentators Gary Thorne and Rick Sutcliffe. Managers Kenny Mayne and Harold Reynolds also provided on field reporting. In the bottom of the fourth inning, after three consecutive inside pitches, batter Nick Lachey charged pitcher Goose Gossage resulting in a faux bench clearing. The National League won 15-8. Due to an ankle injury, Swoopes did not play in the game but was brought in as a replacement home plate umpire in the bottom of the fourth inning after a strike call was disputed by celebrity batter Bill Rancic. The original umpire returned for the fifth inning. The 2005 Taco Bell Legends and Celebrity Softball Game was played on Sunday, July 10, 2005 at Comerica Park in Detroit, Michigan. ESPN broadcast the game after the Home Run Derby with commentators Gary Thorne and Rick Sutcliffe and on field reporter Sam Ryan. The American League won 9-7. The 2006 Taco Bell Legends and Celebrity Softball Game was played on Sunday, July 9, 2006 at PNC Park in Pittsburgh, Pennsylvania. ESPN broadcast the game after the Home Run Derby with commentators Gary Thorne and Rick Sutcliffe. Managers Harold Reynolds and John Kruk also provided on field reporting. The National League won 7-5. AL Rosters: Fred Lynn, Rachel Smith, Kenny Mayne (manager), Jerry Rice, James Denton, Bobby Flay, Sal Iacano, Wade Boggs, Rickey Henderson, Dane Cook, Rollie Fingers, ? NL Rosters: Dave Winfield, Jimmy Kimmel (manager), Gary Carter, Robb Nen, J. T. Snow, Rob Scheider, Ernie Banks, Leeann Tweeden, Ozzie Smith, Jeff Garlin, Alyssa Milano, Gavin Newsom, Lisa Guerrero, ? NL Rosters: Chris Rock, Marlee Manlin, Tim Raines, Ozzie Smith, ? AL Rosters: Maria Menounos, Billy Baldwin, Billy Crystal, Kenny Mayne, Paul O' Neill, Mike Golic, Spike Lee, Goose Gossage, Wade Boggs, Rollie Fingers, ? The 2011 Taco Bell Legends and Celebrity Softball Game was played on Sunday, July 10, 2011 at Chase Field in Phoenix, Arizona. ESPN broadcast the game after the Home Run Derby. There were no commentators for the game but managers James Denton and Erin Andrews provided continuous, on field reporting. For this game an inflatable kiddie pool was placed just beyond the shorter softball fence in right-center field as an imitation of the pool just beyond the MLB regulation fence in right-center field. Andrews explained during the telecast that a ball hit into the pool would be worth 4 runs. The National League won 5-3. The 2012 Taco Bell Legends and Celebrity Softball Game was played on Sunday, July 8, 2012 at Kauffman Stadium in Kansas City, Missouri. 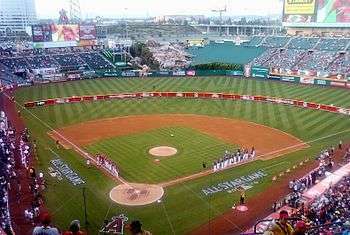 ESPN broadcast the game after the Home Run Derby with commentators Bill Simmons and John Anderson and on field reporter Tim Kurkjian. In the bottom of the second inning Mike Sweeny, Bill Self, and Chord Overstreet hit back-to-back-to-back home runs, a first in L&S Softball history. This game was the first to feature players from the Wounded Warrior Amputee Softball Team. Saul Bosquez, US Army, Operation Iraqi Freedom, and Matt Kinsey, US Army, Operation Enduring Freedom, are both members of the Washington Nationals WWAST. Bosquez played for the AL and Kinsey played for the NL. Kinsey hit a home run and won the MVP award. The National League won 21-8. Bo Jackson was not in the starting lineup due to a hip injury but pinch hit for Joe Carter in the bottom of the sixth inning. Carter was Jackson's courtesy runner; however, Jackson popped out to shortstop to end the game. In 2013, the Legends/Celebrities Softball Game was won by the "home team" National League in six innings with a strong performance by Jennie Finch (Olympian Softball Player) who pitched a complete game for the NL. She was helped offensively from Mike Piazza (New York Mets Legend), Andre Dawson (Legend), and Josh Wege (Wounded Warrior) hitting home runs. Boomer Esiason (NL manager, television personality) and John Franco (NL co-captain, MLB Legend) were the captains of the victorious National League. Felipe Eraso (a top fundraiser for All-Star 5k Fun Run) hit an inside-the-ballpark home run also scoring actor George Lopez, due to a missed diving catch attempt in the outfield and an errant throw to American League catcher Ashanti. Other players for the National League were Alyssa Milano (actress), Kevin James (actor/comedian), and Legends Darryl Strawberry, Ozzie Smith, and Dwight Gooden. Josh Wege, an amputee wounded in Afghanistan was the co-MVP with Kevin James. The American League softball team was led by Craig Carton (radio personality/manager) and Bernie Williams (MLB Legend). Rollie Fingers (MLB Legend) had several costly errors and Ashanti (singer) didn’t fare well defensively or at the plate. Other legends for the AL team included Rickey Henderson, Frank Thomas, and Fred Lynn. Actors Chord Overstreet (Glee), James Denton (Desperate Housewives), AJ Calloway (Extra), Gary Valentine (Actor/Comedian), and 2013 Miss America Mallory Hagan participated in the game. Actor/Comedian Chris Rock was reportedly scheduled to appear in the softball game, but wasn’t shown playing. In 2014, the Legends/Celebrities softball game was held at Target Field in Minneapolis, Minnesota on Sunday, July 13. ESPN broadcast the game following the live broadcast of the 2014 Major League Baseball Home Run Derby. This year's game was won by the "away team" National League in six innings with a strong performance by Nelly (rapper) and David Nail (Country Music singer) who both hit two home runs for the NL. The 2015 Legends/Celebrities Game was held at Great American Ball Park in Cincinnati. Vladimir Guerrero was voted MVP as the American guests won. Petco Park in San Diego was where the 16th Legends/Celebrities Softball Game was played. 1 2 "Sports – All-Star Game Celebrity and Legends Softball Game – Seattle Times Newspaper". nwsource.com. July 8, 2001. Retrieved July 10, 2015. 1 2 "2002 All-Star Game". Major League Baseball. Retrieved July 10, 2015. 1 2 "MLB.com 2003 All-Star Game Event Schedule". mlb.com. Retrieved July 10, 2015. 1 2 "All-Star Sunday Tickets". Detroit Tigers. Retrieved July 10, 2015. 1 2 "Stars to meet in celebrity softball game". Major League Baseball. Retrieved July 10, 2015. 1 2 "2011 Taco Bell All-Star Legends & Celebrity Softball Game info". Major League Baseball. Retrieved July 10, 2015. 1 2 2012 Celebrity All Star Game. YouTube. July 9, 2012. Retrieved July 10, 2015. 1 2 "Stars announced for 2012 Taco Bell All-Star Legends & Celebrity Softball Game". Major League Baseball. Retrieved July 10, 2015. 1 2 "Taco Bell All-Star Legends and Celebrity Softball Game". Major League Baseball. Retrieved 2015-07-10. 1 2 "All-Star Legends & Celebrity Softball Game". Major League Baseball. Retrieved 2015-07-11. ↑ "It's all fun and games on All-Star Sunday". Major League Baseball. Retrieved July 10, 2015. ↑ "Clouds give way to stars for softball game". Major League Baseball. Retrieved July 10, 2015. ↑ "Sports Now". latimes.com. July 11, 2010. Retrieved July 10, 2015. ↑ "Legends, celebs congregate for All-Star fun". Major League Baseball. Retrieved July 10, 2015. ↑ "Legends, celebs congregate for All-Star fun". Major League Baseball. Retrieved July 11, 2016.